The macula makes up only a small part of the retina, yet it is much more sensitive to detail than the rest of the retina. Usually one of the first signs of damage to the macula is distortion to the vision. Patients usually see distortion in straight edges, like door frames that now look bent. The peripheral retina gives you peripheral vision. If someone is standing off to one side of your vision, your peripheral retina helps you know that person is there by allowing you to see their general shape. Dry macular degeneration is more common and causes slow, progressive changes to vision. This condition is caused by aging and thinning of the tissues of the macula. Macular degeneration usually begins when tiny yellow or white pieces of fatty protein called drusen form under the retina. Eventually, the macula may become thinner and stop working properly. People who develop dry macular degeneration must carefully and constantly monitor their central vision. If you notice any changes in your vision, you should tell your optometrist right away, as the dry form can change into the more damaging form of macular degeneration called wet (exudative) macular degeneration. The visual loss with the dry form is usually mild to moderate, but there is no cure for it. Treatment usually consists of adding a multivitamin with anti-oxidants, specifically lutein and zeazanthin. Eye to Eye offers nutritional supplements designed to protect eye health, please inquire. Dry macular degeneration can affect one or both eyes. You may not notice vision changes if only one eye is affected, as your unaffected eye will compensate for vision loss in the other eye. This image simulates a "dark spot" in the visual field. Wet macular degeneration occurs in 10—15% of people with macular degeneration and is a more severe form than dry macular degeneration. Decreased oxygen to the macular area of the eye causes new blood vessels to form. As these new vessels are weak, they tend to leak, causing damage to the macular cells. This is what leads to the "black spot" in the middle of your vision. Vision loss from this form of macular degeneration may be faster and more noticeable than that from dry macular degeneration. Laser and medication injection treatments are available for people with wet macular degeneration; however the visual outcomes are highly variable. The earlier that wet macular degeneration is diagnosed and treated, the better chance you have of preserving some or much of your central vision. That is why it is so important that you and your optometrist monitor your vision in each eye carefully. The Amsler grid (top image) can help detect early signs of retinal disease and monitor changes in vision. The image on the bottom shows an example of distortion and blurring of vision. If you have been diagnosed with dry macular degeneration, you should use a chart called an Amsler grid every day to monitor your vision, as dry macular degeneration can change into the more damaging wet form. To use the Amsler grid, wear your reading glasses and hold the grid 12 to 15 inches away from your face in good light. If any area of the grid looks wavy, blurred or dark, contact your optometrist. If you detect any changes when looking at the grid, you should notify your optometrist immediately. Genetic changes appear to be responsible for about half the reason for individuals getting macular degeneration. Additionally, many older people develop macular degeneration as part of the body's natural aging process. One study found that the risk of getting macular degeneration jumps from about 2% of middle-aged people in their 50s to nearly 30% in people over age 75. Our bodies constantly react with the oxygen in our environment. Over our lifetimes, as a result of this activity, our bodies produce tiny molecules called free radicals. These free radicals affect our cells, sometimes damaging them. This is called oxidative stress and is thought to play a major role in how macular degeneration develops. Approximately 1 in 3 Caucasians have genetic changes that make them more prone to damage from oxidative stress, which can lead to macular degeneration. Heredity is another risk factor for macular degeneration. People who have a close family member with the disease have a greater chance of developing macular degeneration themselves. Fruits and veggies help prevent age-related macular degeneration by lowering inflammation and fighting free radicals to prevent oxidative stress in your body. Some studies have shown that inflammation may play a role in the development of macular degeneration. 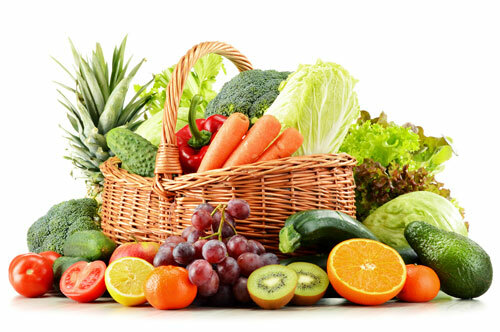 Eating a healthy diet full of fruits, vegetables and dietary fiber has been shown to reduce the risk of AMD. As an addition to a healthy diet, Eye to Eye offers nutritional supplements designed to protect eye health. Smoking and high blood pressure are associated with the wet form of macular degeneration. Research also suggests there may be a link between being obese and having early or intermediate-stage macular degeneration develop into the advanced (wet) form. Quitting smoking at any age, even later in life, can significantly reduce your risk of developing AMD. Studies show smoking increases the risk of age-related macular degeneration, cataracts, glaucoma, diabetic retinopathy and dry eye syndrome. Smoking may increase the progression of the disease by 30%! Smokers are strongly encouraged to quit and begin a multivitamin that does not contain beta-carotene. Though beta-carotene is wonderful for eye health, it has been shown that taking beta-carotene while smoking increases the risk of lung cancer. How can you protect yourself? Eat your fruits and veggies. Research has shown that eating a Mediterranean-inspired diet, with more plant-based foods and less dairy, may reduce your risk of developing age-related macular degeneration (AMD). In one study, researchers found a lower frequency of AMD among those who ate more vegetables, legumes (such as beans), fish, cereals, and especially fruits. In fact, people in the study who ate 150 grams (just over 5 ounces) of fruits per day were almost 15 percent less likely to have AMD. Studies show that people who consume more caffeine are less likely to have age-related macular degeneration. Another finding that surprised the study authors: people who consumed more caffeine were less likely to have age-related macular degeneration. So, go ahead and drink that cup of green tea or coffee in the morning! In the same study, analysis of the specific nutrients within the foods in each person’s diet revealed that dietary fibers seemed to offer protection from AMD, as well as beta-carotene and vitamins C and E.
We know that nutritional supplements play a role for some in lowering AMD risk, as well, but it’s nice to know that changing our daily eating habits can also have a positive effect on our vision.